It’s a small clutch purse that holds your iPhone and a few essentials. It just got funded through a successful Kickstarter campaign. Jenn Deese and her partner Kelley Coughlan started Pursecase to make a product that would hold their iPhone, a few essentials, and more importantly, not get lost. They knew they wanted it to have a pocket for a credit card or ID, as well as a place to hold a key. Speck and other companies make phone cases that have room for a credit card, but it’s the Pursecase design with the chain handle and built-in mirror compact that sets it apart. That and the available colors; black, pink, purple, white, teal and neon yellow. The yellow actually glows in the dark. The big benefit is you don’t actually have to take your phone out of the purse in order to make a call or take a picture. The back side of the purse is open so you have full phone functionality. The purse is made of silicon, something Deese says was a bit of a challenge. They had to come up with a clasp that allowed the flap to open and close easily, as well as lay flat. 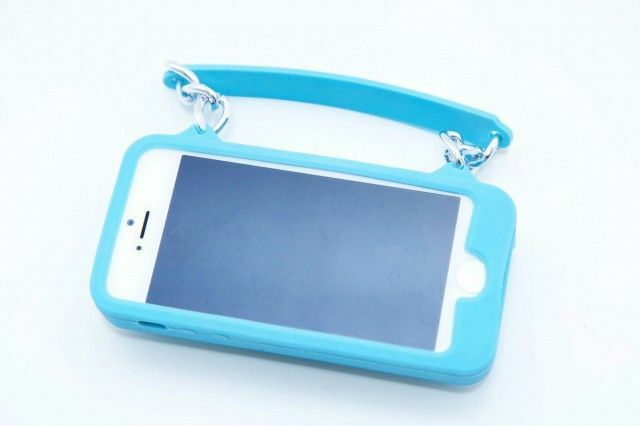 The pursecase is being made for iPhone 4/4S or iPhone 5 and can be pre-ordered on their site for $38. The funding will allow them to make molds for the Samsung Galaxy and other smartphone and tablet models, so Deese says there are more to come.